After the building of a myAVR board (MK1/MK2/light) from a kit you can test the functionalities of the board with help of this test program. Grâce à se programme, vous pouvez tester les functionalités des cartes de développement myAVR (MK1/MK2/light) en kit que vous aurez assemblés. Lorsque que vous faites l'acquisition d'une carte assemblée, ce programme est déjà chargé dans le microcontrôleur. The bootloaders for special myAVR products (e.g. mySmartControl, myAVR Board light, myAVR Stamp, ...) are preinstalled in the delivery state. The bootloader can be updated or burned via the ISP interface. By the name of the elf-file you can see the microcontroller and the related clock pulse. This document describes how you can use the programmers mySmartUSB with AVR Studio 5 and 6. The programmes mySmartUSB MK3 and mySmartUSB light can be directly used as STK500 programmers. If you use the mySmartUSB MK2 it's necessary to execute the myAVR ProgTool out of AVR Studio 5 and 6. The needed steps are described in this document. 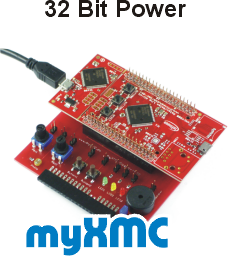 mySmartUSB light is a compact USB programmer and communication interface for Atmel AVR-microcontrollers in USB stick. 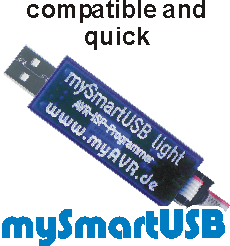 The USB programmer mySmartUSB light is produced in SMD technology and fully equipped in a plastic-casing. It has an 6-Standard-ISP connection. For communication with the PC it uses a virtual COM-Port. mySmartUSB light-SupportBox: a small tool on a graphical interface for switching and update the mySmartUSB light. 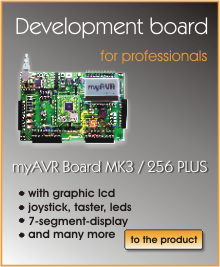 The myAVR Board light has no comfort like the myAVR Board MK2 and MK3. It has only the most essential elements which are necessary for the learning with the board. The board is equipped with a RISC AVR-microcontroller (ATmega8) from ATMEL In addition there are some typical input and output devices integrated. The myAVR Board light has no comfort like the myAVR Board MK2 and MK3. It has only the most essential elements which are necessary for the learning with the board. The board is equipped with a RISC AVR-microcontroller (ATmega8) from ATMEL. This document includes technical and machanical data, the circuit diagramm and notes for the programmer settings.